Astronomers looking for planetary systems that resemble our own solar system have found the most similar formation so far. British astronomers, working with Australian and American colleagues, have discovered a planet like Jupiter in orbit round a nearby star that is very like our own Sun. Among the hundred found so far, this system is the one most similar to our Solar System. The planet's orbit is like that of Jupiter in our own Solar System, especially as it is nearly circular and there are no bigger planets closer in to its star. "This planet is going round in a nearly circular orbit three-fifths the size of our own Jupiter. This is the closest we have yet got to a real Solar System-like planet, and advances our search for systems that are even more like our own," said UK team leader Hugh Jones of Liverpool John Moores University. The planet was discovered using the 3.9-metre Anglo-Australian Telescope [AAT] in New South Wales, Australia. The discovery, which is part of a large search for solar systems that resemble our own, will be announced today (Thursday, July 3rd 2003) by Hugh Jones (Liverpool John Moores University) at a conference on "Extrasolar Planets: Today and Tomorrow" in Paris, France. "It is the exquisite precision of our measurements that lets us search for these Jupiters - they are harder to find than the more exotic planets found so far. Perhaps most stars will be shown to have planets like our own Solar System", said Dr Alan Penny, from the Rutherford Appleton Laboratory. The new planet, which has a mass about twice that of Jupiter, circles its star (HD70642) about every six years. HD70642 can be found in the constellation Puppis and is about 90 light years away from Earth. The planet is 3.3 times further from its star as the Earth is from the Sun (about halfway between Mars and Jupiter if it were in our own system). The long-term goal of this programme is the detection of true analogues to the Solar System: planetary systems with giant planets in long circular orbits and small rocky planets on shorter circular orbits. This discovery of a -Jupiter- like gas giant planet around a nearby star is a step toward this goal. The discovery of other such planets and planetary satellites within the next decade will help astronomers assess the Solar System's place in the galaxy and whether planetary systems like our own are common or rare. Prior to the discovery of extrasolar planets, planetary systems were generally predicted to be similar to the Solar System - giant planets orbiting beyond 4 Earth-Sun distances in circular orbits, and terrestrial mass planets in inner orbits. The danger of using theoretical ideas to extrapolate from just one example - our own Solar System - has been shown by the extrasolar planetary systems now known to exist which have very different properties. Planetary systems are much more diverse than ever imagined. However these new planets have only been found around one-tenth of stars where they were looked for. 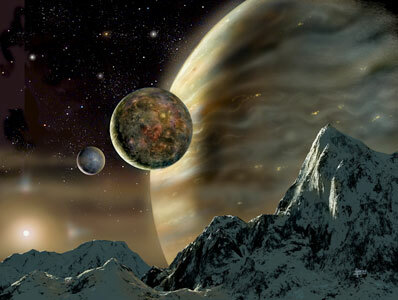 It is possible that the harder-to-find very Solar System-like planets do exist around most stars. The vast majority of the presently known extrasolar planets lie in elliptical orbits, which would preclude the existence of habitable terrestrial planets. Previously, the only gas giant found to orbit beyond 3 Earth-Sun distances in a near circular orbit was the outer planet of the 47 Ursa Majoris system - a system which also includes an inner gas giant at 2 Earth-Sun distances (unlike the Solar System). This discovery of a 3.3 Earth-Sun distance planet in a near circular orbit around a Sun-like star bears the closest likeness to our Solar System found to date and demonstrates our searches are precise enough to find Jupiter- like planets in Jupiter-like orbit. To find evidence of planets, the astronomers use a high- precision technique developed by Paul Butler of the Carnegie Institute of Washington and Geoff Marcy of the University of California at Berkeley to measure how much a star "wobbles" in space as it is affected by a planet's gravity. As an unseen planet orbits a distant star, the gravitational pull causes the star to move back and forth in space. That wobble can be detected by the 'Doppler shifting' it causes in the star's light. This discovery demonstrates that the long term precision of the team's technique is 3 metres per second (7mph) making the Anglo-Australian Planet Search at least as precise as any of the many planet search projects underway. PPARC is government funded and provides research grants and studentships to scientists in British universities, gives researchers access to world-class facilities and funds the UK membership of international bodies such as the European Laboratory for Particle Physics, CERN, the European Southern Observatory and the European Space Agency. It also contributes money for the UK telescopes overseas on La Palma, Hawaii, Australia and in Chile, the UK Astronomy Technology Centre at the Royal Observatory, Edinburgh and the MERLIN/VLBI National Facility.